Keep your beer tasting fresher, longer! 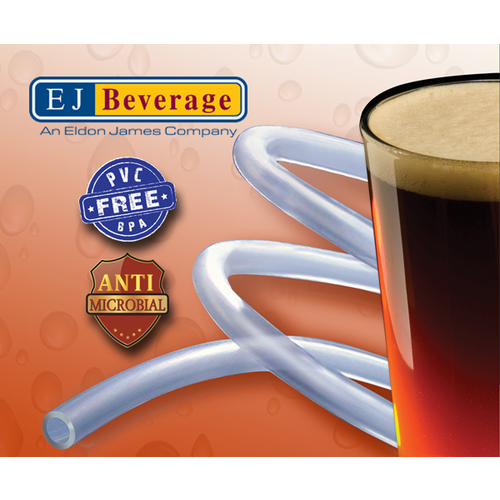 EJ Beverage has reinvented how beer gets from keg to glass with their cutting edge Ultra Barrier Silver™ beer tubing. The unique silver lining used in Ultra Barrier Silver has been proven to be 100% effective against the top 4 beverage spoiling bacteria for up to 2,000 liters of flow. The tubing is also PVC and BPA free, standards observed in Europe for years for beer tubing that are just recently being followed in the USA. The tubing was lab tested by the famed Weihenstephan University in Germany and then prior to release was tested for years at The New Belgium Brewery. Sold by the foot. 3/16" is the best size for most beer lines under 9' in length. Ideally, 6' provides the correct restriction for serving beer in the 8-14 psi range. What is the best cleaner to clean these lines? BEST ANSWER: I use BLC occasionally, but usually just push PBW through it for a while. For either one I then flush with water, then send Star San through and flush once more. No problems so far with either approach! I use a light solution of regular PBW after flushing the lines with hot water. Then rinse with fresh water, and sanitize with StarSan. I use BLC and follow the instructions. Normally after each keg. And I replace them about every 2 years. Upgraded to these about a year ago and I like how easy it is to tame these hoses in my kegerator to go where I want and not flop back into my way. Taste is super clean, as they advertise, no off tastes of any kind to me. This line didn't work for me. I installed it in my keezer and consistently got an off flavor on the first pour -- made the beer taste oxidized/stale. The off flavor was only in beer that had sat in the line for an hour or more. If I dumpe the first pour it was fine. I have two taps and both had the issue and I sanitized the lines multiple times trying to get rid of it. I ran several kegs through the lines and the problem persisted. I replaced the lines with standard beverage tubing and have no issues now. I changed my lines for the first time in 2y+ (cleaned after each keg w PBW and/or BLC). This tubing is great, no off flavor's from the plastic and this is the cheapest I've found the tubing online. I also think they give you a little extra just to make sure you get what you ordered. All around best buy! I manage a bar and it was time to change the beverage tubing. After a bit of research I opted to use this product and what a good choice! We have our taps cleaned regularly, but after time the tubing just absorbs those off flavors. I installed 8 keg lines with ease with this tubing. This stuff works straight out of the box and has no plastic flavor or smell. Let me tell you the beer tasted 100% better after changing to this tubing. I recommend using this stuff. Been using this stuff for a few months ago. I didn't notice a marked difference in my beer; which I guess is a good thing. My hope is that I can use this stuff a bit longer than normal lines with less maintenance. This tubing is a very good product. Great flexibility vs stiffness. Easy to cut. Seals well with a hose clamp. I try to keep my lines as clean as possible, so don't know about the anti microbial factor. Even if it didn't have anti microbial properties this tubing is worth the extra price. I neglected my previous kegerator for 3 years when I accepted a job in another state. When I returned home, the keg tubing in my kegerator was dis colored and moldy. I built a new kegerator with this new Ultra Barrier Antimicrobial tubing and I couldn't be happier. It does as advertised. No off favors, easy to cut and easy to clean. Works as described. Easy to install and cut, this tubing got rid of the plastic flavor that would be in the first 1/2 ounce of beer that sat for a while in my previous lines. Hose seems to not stain and stays cleaner longer between cleanings. Seems softer and more flexible than previous types of beer line. I found i needed a sharper blade to get a clean cut, possibly due to the silver liner? Although I'm a bit skeptical about the antibacterial nature of this product, it's physical properties are great. It doesn't kink and coils nicely. fits inside my small kegerator great. I put 12 feet in. Time will tell if it resists the bacteria. This tubing was worth it to me to ensure nothing unintentionally sours any of my beer. Beer tastes so much better. I have a 4 tap set-up and it sometimes can take a while to go through a particular keg, so these lines have been great-no more off-flavors. Very easy to work with and stay flexible when cold. Stays flexible in the cold. Absolutely ZERO flavor transfer. These lines are truly great. Compared to some of the other options out there I think there is really no comparable options. Will order again! As a new kegger I went with the included vinyl lines but increased the length to 12' for a foam free pour. Everything went great setting it all up and after two weeks of force carbing my Pumpkin Ale and Belgian Saison I opened the taps with excitement only to be stunned by a horrendous off taste I've never had in nearly four years of bottling. I was describing it as soapy/metallic but I've now come to know it's the taste of vinyl. Since that first small sampling I'd thought the beer was possibly the cause, maybe it was too young and needed more time. So I let it sit another week and took a small sample and same bad off taste. Eventually I decided to pull full pints and the taste appeared to be fading. That however was wrong, the off taste was simply being diluted. Apparently, any beer that sits in the vinyl beer lines for more than 1 hour takes on that terrible plastic taste. At 12' 3/16" ID tubing that equates to only 2oz of beer. I'd done testing and confirmed the first two ounces has that terrible taste and the beer right after does not. A lot of people simply pour off the first 2oz but that really adds up and I wanted a solution. Researching online I found I'm nowhere near alone with this complaint and there are a lot of solutions. The most popular one is another brand of tubing that is much more rigid than vinyl and also provides much less resistance to flow which requires even longer lines. My triple tap kegerator is tight enough on the inside I really didn't want to go with longer lines and special fittings. I came across EJ Ultra Barrier Silver lines and the description seemed to fit everything I was looking for - mainly no off tastes and secondarily equal flow resistance, flexible, and clear. There certainly aren't many reviews online about them and the few there are appear very positive with a few quoting foaming issues. I took the chance and ordered 3 x 12' lines and installed them with ease. One review I'd read said not to heat the tubing ends with boiling water so I used water about 180-190 degrees or so and heated the end. Gently got the barb end into the tubing then pushed it in straight with no problems at all. I didn't have any crimpling or distortion of the inner tube lining on any of the three lines. I let the lines sit cold in the kegerator overnight and next day pulled a sample, tremendous foam. So I asked another forum member who has the lines and he'd told me to give it several more hours and it will work itself out. Came home that night and pulled a pint with a bunch of foam but noticed there was now more beer in the glass than that first pull. Took another pint glass and it poured flawlessly. Since then it's been pouring great with no excess foaming issues. Just used another one of the lines for the first time last night and the foaming was the same first pull but was fine for the second and as of this morning it's pouring perfectly. So, I guess the point is if you have foaming at first don't panic. I don't know the reason, perhaps the silver particles in the line need to react to the beer the first time which causes nucleation? After that the reaction appears to stop, at least it has for me on the two lines I've used so far. Now, to the important part... NO off smells or off tastes with these lines! I've tested on two beers now, one I've let the beer sit for a few days in the lines and tested comparing taste/smell between the first 2oz pull and second 2oz pull and couldn't distinguish any difference. I figured I wouldn't post a review until I tried running my lightest beer yet through the line since the lighter beer should show any off tastes easier. The beer was sitting in the lines for about 11-12 hours and the sample pulled today had no off smell or off tastes that I could detect. Some have said they still notice an off taste to these lines and perhaps they can but I cannot. In retrospect the vinyl taste/smell was completely obvious and apparent to me where some don't notice it. My family members even noticed it easily. Anyhow, I'm very happy I found and bought these beer lines and highly recommend them. Not only do they get rid of that terrible plastic smell and taste but they have the addition of anti-microbial properties. Not sure how helpful that is to the homebrewer with a kegerator as opposed to commercially, but it's an added bonus for whatever it's worth. If you have any questions my username on homebrewtalk (dot) com is Rev2010. Much better quality than the inexpensive PVC tubing, and much easier to use than "Bev Seal Ultra" with PET lining (which is very stiff and requires much longer lines to get adequate line resistance). The tubing is thick, but still flexible and it is very easy to install barb fittings. The rated 2.2 pounds of resistance per foot seems spot on, even highly carbonated beers do just fine with under 10' of line. I plan on using this for the rest of my beer line because it is so easy to work with, doesn't impart a plastic taste, and has adequate flow resistance. Would highly recommend to everyone looking for quality beer lines! This tubing is something else. Solid, heavy and kink resistant for sure, but be aware that if heated up too much (hot water to get the barbed fittings in) you can over-do it. This tubing is THICK, and takes on a melted different-substance state when hot, and it will cool and retain a new deformed molded shape. My first attempt to insert a barbed end was a fail: apparently it was too hot, it mushed all up as I inserted the barb, and the ID got all ribbed and jagged. My second attempt was better, but I was still unhappy with how when it cooled, the insides were rippled and distorted. My third and fourth tries went well, heating the tube with not-as-hot water this time, and only the tip (1/4?) of the tube. I slowly got the very end of the barb started, then with a straight even thrust, I pushed the full length of it in with one smooth motion. Perfect fit. It cooled with a complete seal and tight grip, and no inner deformities to cause turbulence. I?ve never been a fan of vinyl tubing. Always been a fan of spending a little more to get a better product. Good product, eliminates plastic flavor. I tried to get "traditional" PVC beer line from other places and every time (4 separate vendors) my beer ended up having a terrible plastic taste after sitting in the line, even if it had only been a couple of hours. Finally I found out about this product and decided it was worth a shot. I know there are other PVC-free products, but this is the first one that I found that is flexible, clear, and easy to install onto hose barbs. I am extremely happy with this purchase and will be using this line for all of my future keg lines. You do need to allow the line to cool down to your fridge temp before you push beer through it, as you will get excessive foaming if you don't. I still get a tiny bit of CO2 breaking out of solution, which leads to a small group of bubbles at the peak of my line, but it still pours a good pint, and I think with a little tweaking I can eliminate this. Overall, great product, and most importantly, it ELIMINATES THE PLASTIC TASTE!